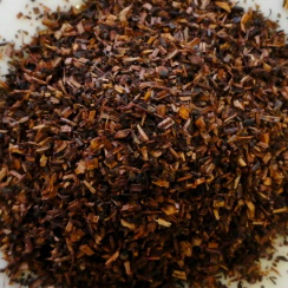 Rooibos (ROY-boss) , sometimes called "red tea" is only grown in South Africa and has been enjoyed there for centuries. Lucky us, we have finally learned about this wonderful bush with its needle-like leaves. Full of antioxidants, Rooibos has great flavor with rounded, soft sweetness. Deep, red color that, unlike most tisanes, loves a splash of milk. Naturally un-caffeinated. Great choice for those who are sensitive to caffeine and would like a stronger cup. Vanilla Rooibos is made from a high grade of Rooibos blended with natural vanilla that adds extra creaminess. Not overpowering, good balance.